QR codes are a great marketing tool. The only condition is to use them in the right way. You may have seen them on adverts, posters, receipts or leaflets. In fact, they are everywhere! QR Codes can be include on printed collateral, for outdoor campaigns, even online. The possibilities are endless. QR code stands for “Quick Response” because they provide users with fast access to information. They are just like a barcodes, but packed with lots more information.Anyone with a smartphone or tablet can just take a picture of a code using a free app.Their phone then triggers an action. It can be a link to download content, some contact information, a message or a link to a website. WHY SHOULD YOU USE QR CODES? WHAT CAN YOU ADD QR CODES TOO? Business Cards – your recipient can save your contact details simply by scanning the code. Marketing Collateral – Got a big sale on? Direct customers to your special offers page. On exhibition stands – you can direct visitors to s specific page of your website. Email Signature – direct people to blog posts and online newsletters. Adverts – saves on advertising space. Invoices – to link people to your Facebook, Twitter or LinkedIn page. We have successfully added QR codes to some of our client’s leaflets and banner stands. I bet when you start looking you will notice them everywhere! So don’t miss out! 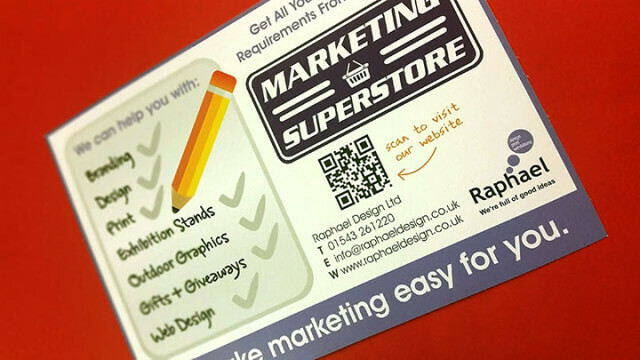 Why not get in touch with the team at Raphael Design for advice on how best to use QR codes and help your business grow. NEED HELP CREATING A QR CODE? Our colleagues at printing.com have free QR creator that you can use. Just give us a call on 01543 261220 or drop us an email and we will show you how it works.